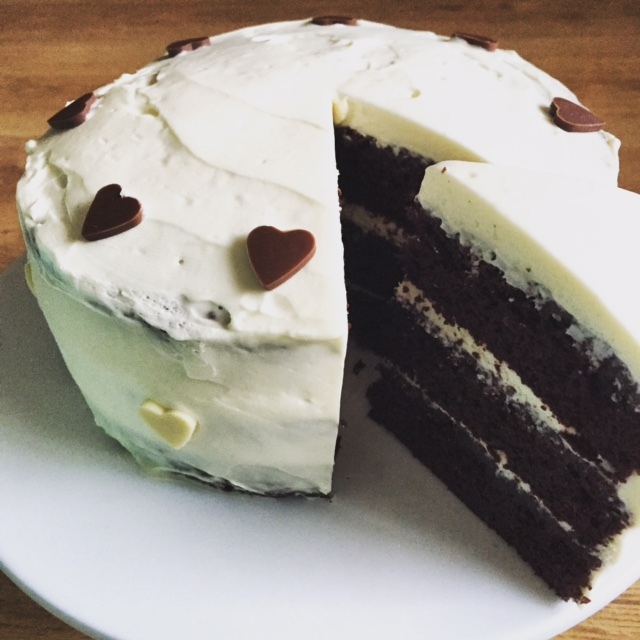 This is one of those recipes that I had printed out months ago and just never got around to baking yet, then having no review lined up and no money to eat out (payday problems!) I decided to give it a shot. I have no idea what drew me to this cake … being someone who wouldn’t drink Guinness if you paid me (honestly!) , I didn’t have high expectations. So I was super surprised to actually REALLY like it, there isn’t a huge amount of Guinness so it’s not overpowering and for those who think most chocolate cakes are too heavy (not me 🙂 ) it’s not too chocolatey either – just the right balance! 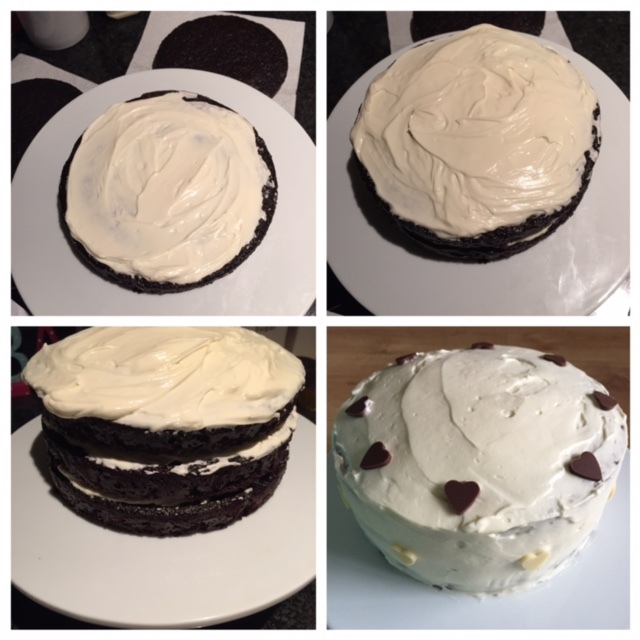 It’s a Nigella recipe so I’ve no idea how other Guinness cake recipes compare but this is going to be my default now. When I posted a photo to the blog Facebook it got lots of interest so here you go! 75 grams cocoa powder – sieved – it must be sieved or it will be all lumpy! 275 grams plain flour sieved – it must be sieved! 1. Preheat the oven to 180°C/approx 160 for a fan oven. Butter and line your tins, I used 3 7 inch sandwich tins… my trusty old reliable cheap Argos ones! You could also use a 23cm / 9 inch tin. 2. Pour the Guinness into a big enough saucepan, add the butter in chunks and heat until the butter’s melted. In a separate bowl mix together the sugar and the sieved cocoa powder and add it to the pan a bit at a time, mixing well while you add. 3. In a separate bowl, beat the sour cream with the eggs and vanilla and then pour into the mixture in the pan too and finally mix in the sieved flour and bicarb. 4. 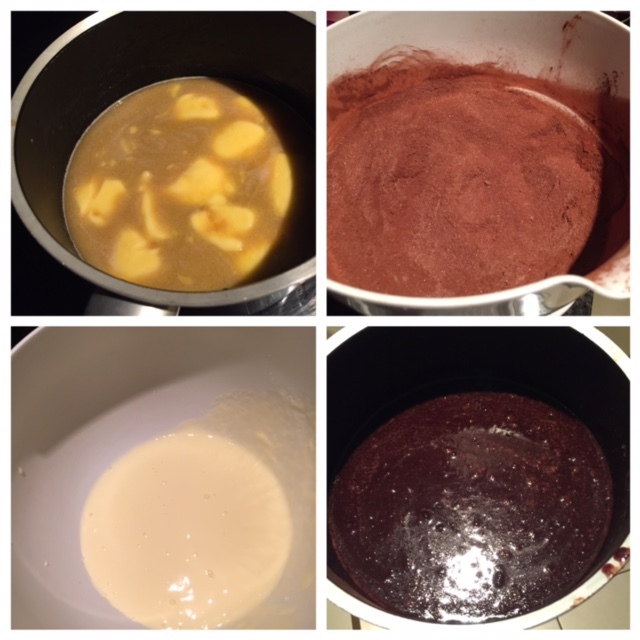 Pour the cake batter into the greased and lined tin or tins and bake for 45 minutes to an hour. Leave to cool completely in the tin on a cooling rack, as it is quite a damp cake. My 3 smaller layers only took 45 mins but if you did one big one it would take the longer scale. 5. 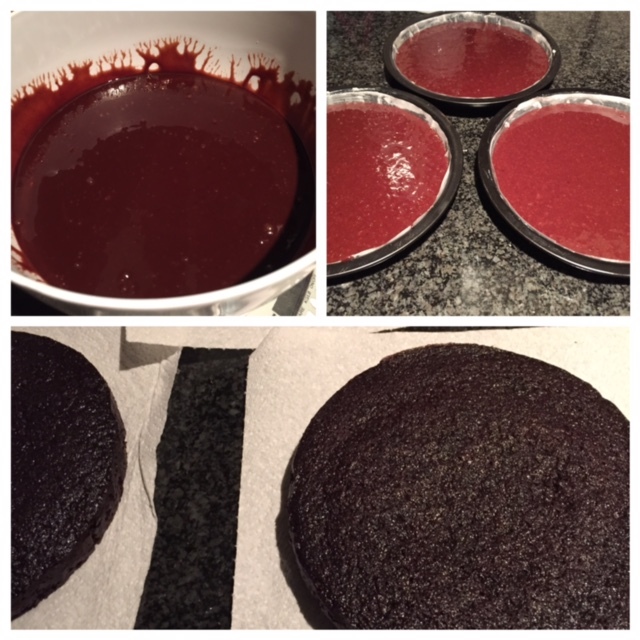 When the cakes are cold, sit it on a flat surface and start the icing. I use an electric whisk for this part. Beat the cream cheese until smooth, sieve over the icing sugar and then beat them both together. Add the cream and beat again until it thickens up enough that it wont run off your cake or anything. Ice the top of the first layer, throw the second layer on top, ice the top of that then put the last layer on and cover the top and sides with icing. I just roughly iced this with the back of a knife. Kate – this looks so good! This is fantastic- was seriously on need of a chocolate cake recipe after misplacing my mum’s. Definitely going to give this a whirl!